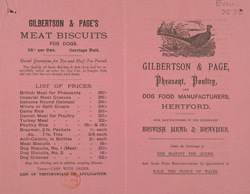 This is an advertisement for Gilbert and Page, pheasant, poultry and dog food manufacturers. By the 19th century physicians had begun to investigate the properties of animal foods. With a greater understanding of animal’s physiological make up and of the nutrients contained in the food, products were developed that contributed to healthy and strong livestock. This leaflet features a product list with the price noted beside each item.